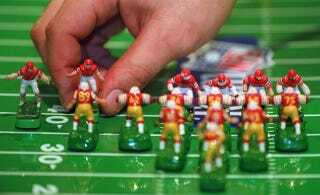 Before fantasy football, before Madden NFL, before even Tecmo Bowl, there was Electric Football, the wonderfully aggravating tabletop game that sent players scurrying aimlessly (so it seemed) about a miniature metal field. Powered by a small motor—and subject only to the whims of metallic vibration—this pastime was an idea hatched by one Norman Sas, whose family had acquired a company that used the technology to make small-scale horse racing and car games. Even if you've never played the game itself, if you know that buzzzzz, you know Electric Football. (1) There was a massive pileup at the line of scrimmage—something like the old flying wedge play that led Teddy Roosevelt to threaten to ban football—from which your back simply couldn't extricate himself. (2) Your back took off like a bat out of hell...toward the wrong goal line, something like Roy Riegels in the 1929 Rose Bowl. (3) A strange tropical disease suddenly beset your back and he began moving in a circle, around and around, joined, perhaps, by two or three linemen eager for any break from the tedious routine of blocking. OK, so pretend that you had never heard of Electric Football before and you read this description. Doesn't that sound awesome? Don't you picture you this and immediately smile? This was the very essence of unpredictability. You had essentially no control over anything, other than the on/off switch. You were playing the role of a laissez-faire God. It was pure randomness, and it was beautiful. Early versions of the game included figures that bore little resemblance to real players. But in the 1960s, Mr. Sas began working with an industrial designer, Lee Payne, who had played a year of college football at the University of Georgia. Mr. Payne helped him improve the aesthetics of the game, making the figures more lifelike, with specific team colors; giving the players some degree of directional control and adding a cardboard representation of a stadium, which was mounted to the side of the frame. The National Football League began licensing the product in 1967, and it became a fixture in the toy section in the Sears catalog. The company, which Mr. Sas renamed Tudor Games, thrived into the 1980s, until new hand-held games, and later video and computer games, made it seem quaint to a new generation of children. In the 1960s four companies made Electric Football games. By 1991, after the bankruptcy of Superior Toys, there were none. Since Miggle began producing the game board and pieces in '93, there has been something of a revival. The Electric Football elite, like that of Dungeons & Dragons or Magic: The Gathering, is a tight community of mostly single men (note: Electric Football tournaments are not good spots to meet the honeys) who communicate through Internet chat rooms. Secrets—how to make the players move faster, ways to illegally widen the base of each player—are the hot topics. Fashion is not. Watching Electric Football is, 99% of the time, Meet Joe Black dull. The switch is flicked, the little men vibrate. If a receiver happens to get open, the switch is flicked off, everything stops, and a tiny quarterback figurine chucks an even tinier foam football. If the football hits the receiver, the pass is complete. The switch is flicked on again and—yawn—everything moves. Still, Sas's creation had a memorable run, and it should come as no surprise that he was nothing short of a prodigy, even before Electric Football entered his thought process. He was a graduate of the Bronx High School of Science and earned two bachelor's degrees from MIT, in between which he was a commissioned officer in the Navy. And yet, even as his success and personal wealth exploded in the '60 and '70s, he was also keen enough to know the end was nearer than anyone else expected. As his widow told The New York Times, "He said: ‘Listen, this is it now. We're making a killing on it, and it's going to end as soon as the electronic versions come out.'" Sas understood buzz in every sense of the word. For a while, in shag-carpeted rec rooms across America, the little men vibrated. Then the switch was flicked off.